This summer, I have been trying to do my long runs on Fridays. That lets me get them out of the way before the weekend and I don’t need to make that same time commitment to my training, leaving more time for the family. Since school has been out, I’ve run 4 of my 7 long runs on Fridays and the other three on the weekends. Getting yesterday’s 30K done was touch and go. My oldest son worked late on Thursday night so he didn’t get home and to bed until 2:30. Like most moms, when my son is out late, I am up late too – especially when I have to get him home. The Littlest Dude, then, woke me up an hour after I climbed into bed and I ended up tossing and turning until daybreak. When I should have been up and out for my long run, my pillow spoke to me; there was no way I was going to be able to run 30K on less than 4 hours of sleep. I regretted listening as soon as I got up. I was now facing a late afternoon run, which would have been fine as my other Friday runs have been in the late afternoon, but I had really wanted to get it out of the way early. At 4:00, I finally headed out into the heat of the day. It wasn’t actually that hot, especially compared to the temperatures we have had the few weeks before. In fact, with the gentle breeze, I felt quite comfortable. I stopped at a Rec Centre for water and a bathroom break 9K in, and again at the Soccer Club, another 9K later, for more water. As usual, I had one GU gel somewhere in between. I had more water at Coach Kevin’s house, who was going to run the last 8K with me, and I needed a bathroom again. That should have been my first clue that I was heading towards the danger of dehydration. It wasn’t even 2 km later when I suddenly started to feel tired. I attributed it to my earlier pace. “I think I pushed harder than I needed to in the first part of my run. I’m starting to feel it now.” Soon after that, I had to stop. “I’m feeling sick.” We started to run when the nausea passed, but shortly after, I had to stop again. The rest of the run was stop-go-stop-go until I felt an ache in my lower back; at that point, I knew I needed to stop and walk the rest of the way. On the walk home, I tried to figure out why I was running so poorly. I should have been able to handle the distance. It was hot, but I had run close to the same distance in hotter and more humid weather. I kept going back to the same reason: I ran too fast at the beginning. When I got home, I realized what had actually happened; I had become dangerously dehydrated. Chilled and cramped after stretching. Dehydration had set in. As soon as I walked in the door, I headed to a bottle of Gatorade. Within minutes, I got the chills and shakes and had to put on some layers. 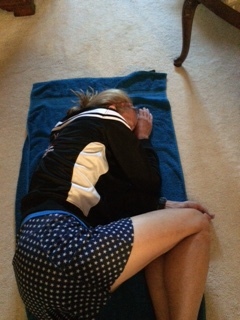 I stretched – especially my lower back – and fell asleep on the floor. When I woke up an hour later, I drank some water. Suddenly, I needed the bathroom; I was going to throw up. After that, I broke out in a vicious sweat. I crawled into bed, water bottle and Gatorade at my side, and slept for another 40 minutes. When I got up again, it was dark. The feelings of nausea had passed and I finally felt strong enough to shower. Before doing so, I weighed myself and had dropped 4 pounds (and that was after taking in a litre of liquids!). By the time I felt like eating, it was late evening. I found leftover roasted potatoes and sausage from the night before – perfect! One huge plate of spuds was exactly what my body needed! This morning, I was feeling much better. My weight is almost back up; I am still rehydrating and eating fruits and protein-rich foods. The aches and pains are gone. Today is now a non-planned day off running; tomorrow will be better. All set for a day of rehydration! So, what went wrong? 1) Pacing – I did go out too fast. I ran the first 23k at a 4:45 (km) pace, when I should have been running a 5:00 kilometre. 2) Fluids – Even though I was drinking as much as I normally do, I didn’t get in enough. It was hotter than I thought and I had no shade. The faster pace/heat/low fluids was a bad combination. 3) Nutrition – I fuelled the day and night before, thinking I was running in the morning. This left me feeling full so I probably hadn’t eaten enough through the day to fuel my late afternoon run. What went right? 1) Even though the last part of my run was stop and go, I ran 30K, plus the 1.5K that I walked home at the end. Now I can work with that distance, zone in on my pacing for a few weeks and build a little more. 2) Recognizing that I needed to stop. I don’t want to think where I could be today if I hadn’t. 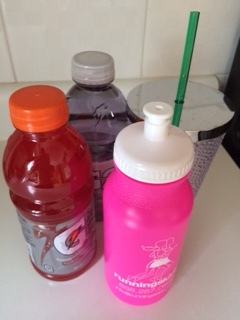 3) Family support: Once my boys saw the shape I was in when I got home, they are talking about riding with me so that I have liquids and company when I head out on my next long run. Support vehicles are the best! Everyone training for a marathon has to have one tough training run, one when they completely fall apart. Yesterday, I had mine. Thank goodness it is out of the way!